This Queens-based baseball team has a passionate following in the National League's East Division. Are you one of those passionate, die-hard fans? 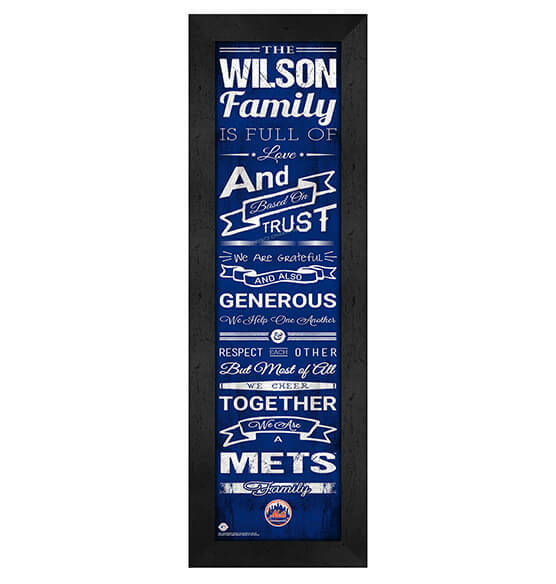 Our Personalized Family Cheer New York Mets Wall Art is the perfect decoration to treat yourself to! This customized sports decor MDF vinyl-wrapped print is made from quality printed paper protected with crystal-clear glass and arrives ready to hang with a sawtooth hanger. Celebrate your special love for the Metsies — and for your family — with this customized, vertical-hanging sports decor featuring a vintage touch. Great to give as a thoughtful gift too!